Should I deed my house to the bank? A full price offer the first day draws suspicion toward the agent. While it is possible it means they did a great job reading the market, it may mean the house was a “steal.” You may have picked an agent who provided poor advice, either through ignorance or duplicity. Reader Question: I am 83. We bought a property in Maryland in 2006 for $225,000. My husband died in 2012. The agent felt it would take $99,900 for a short sale to sell it. Got a full-price offer the first day but the bank denied the short sale and appeal. I had a break-in and robbery, felt isolated, vulnerable and lonely. Opportunity came up to move so I abandoned the house and moved to a retirement community near family in Oregon. I am still paying utilities but haven’t paid the mortgage for four months. 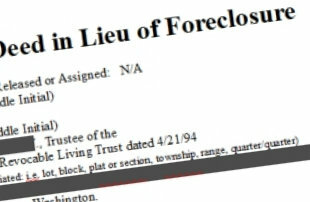 Bank has approved my application for “Deed-in-Lieu” but I haven’t received any paperwork. They have not had the property inspected to assure it meets their condition requirements. I’m beginning to worry about my financial obligations. Should I withdraw the application, pay overdue mortgage and find a broker to rent property? Mary C.
Monty’s Answer: Hello Mary, and thank you for your question. There are many factors in making the right decision. Are you consulting with anyone now? How many real estate agents did you speak with when you initially decided to sell? How did you pick an agent? Without knowing the answers to questions like these, it is hard to say how to proceed. You paid $225,000 for a house in 2006, and now it is worth $99,000? That opinion is worth a second or even third opinion. In some markets around the country, home prices have rebounded to near pre-meltdown levels. A full price offer the first day draws suspicion toward the agent. While it is possible it means they did a great job reading the market, it may mean the house was a “steal.” You may have picked an agent who provided poor advice, either through ignorance or duplicity. Consider contacting real estate agents that specialize in foreclosure properties. You can find them by searching online for “foreclosure specialists” or similar words. Here is a question and answer on DearMonty.com that describes how real estate agents have reacted to the real estate meltdown. The melt-down happened not long after you and your husband bought the home. It is an important distinction to understand because many real estate agents chose not to participate during that period and did not pick up the knowledge necessary to provide good advice in these situations. There are specific questions to ask them; how many short sale and foreclosures do you have in process right now? Do you have an attorney on the team? How many members are on the team? How many short sales and foreclosures have you handled in the past twelve months? What is the size and location of your territory? What percentage of the caseload you take on is successfully closing? What other types of real estate transactions do you handle? Before you give them a lot of information, get a lot of information. Here is an article on DearMonty.com about choosing the right real estate agent that may provide additional insight for you. Do not rent the property. It only delays (and possibly compounds) the situation. You are too far away to get into the rental business. Seek financial advice from a professional. ​I mean a Certified Public Accountant (CPA) who is intimately familiar with your personal finances. Talk to your CPA before you complete this transaction, not after.​ The IRS may consider debt forgiveness as income, so understanding this implication is an important factor. You may also want to consult with an attorney who has similar foreclosure experience as suggested would be possessed by a real estate agent. Your financial situation may play a part in the solution. You indicate you can get current on the loan. That may be the reason the bank denied the short sale originally. Having the capital to get current on your loan and funding the shortfall when the home sells is another consideration. The importance of your credit standing in the future, the tax implications and even the moral point of view can be considered. Here is the answer to another reader’s question about the right thing to do in this situation on DearMonty.com that may give you more insights to the solution. The bottom line is to take a closer look at what happened, get further information and then make your decision.